As of June 27, Oakwood Street was completely blocked for a hundred yards just north of Washtenaw (marked X on the map). It might still be closed for construction on July 15. If it is still closed, follow the detour N on Cornell, E on Mayhew, then S on Oakwood to #1, the Oakwood Lot. Park near the “bridge” entrance #2 of the Science Complex (Mark Jefferson). Addendum: I’m glad to report, as of today (July 12) at least, that Oakwood St. just north of Washtenaw Ave (and just west of the famous water tower) is open for traffic during construction so the aforementioned detours should not be neccessary Friday evening. 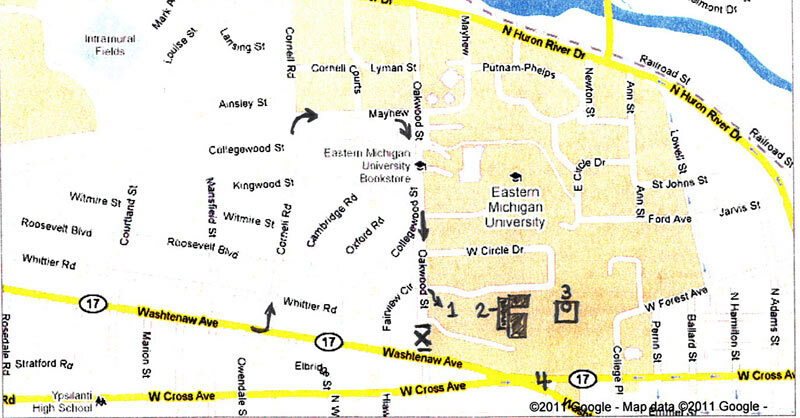 Folks can enter the EMU campus from Washtenaw Ave though it is cozy passing the construction barrels. They’ll turn right into the Oakwood parking lot at the end of the construction zone, marked by the first stop sign, and another right into lot as dictated by a concrete baracade. The Oakwood parking lot will be wide open and free Friday evening so spots near the entrance should be easy to come by. Other landmarks showned on the map: #3 Sherzer Observatory, #4 Water Tower. The meeting will be held inside the planetarium sphere, located within the science building. Enter the science building across the suspended walk bridge, noting the plantarium atrium to your left after you enter. A look downward reveals rocks of Michigan on the floor below, upwards 3 stories is the dramatic sphere. Elevators to the sphere are to the right of that entry way, then left, then right again. Or you can use the stairs. Entry to the Sphere area is through a grey construction door, left off the elevators on the 4th floor. It sounds confusing but I’ll have the place well marked, and we’ll make it worth the effort with pizza and a fun planetarium show. Now tell me, what other planetarium would let you guys have at the controls?! You’ll see... Folks will find us by the scent of pizza wafting down from above. The weather forecast is for a comfortable 80 and partly cloudy that evening. We’ll have a good, diverse program awaiting... the planetarium night sky, full dome demos, even Saturn through the 10-inch apo (weather permitting), a video treat and more. The sphere holds 37 but we can squeeze in a few more. We can have pizza and pop just outside the room in the immediate lobby. There are a few tables and some chairs for that. Views from the upper levels, 3rd and 4th floors, are dramatic. If clear afterward, I can stick around for a trek over to the 10-inch apo as well. We’ll see what the weather holds for us. Never hurts to see Saturn for real in the 10-inch apo with a 17mm Ethos after we visit the virtual view from Mimas just outside the rings! See also the article “Eastern Michigan University unveils new $90M Science Complex.